Can DHEA Really Help With Impotence or is it Unproven? Can DHEA Supplements Help With Erectile Dysfunction? Whether or not DHEA benefits erectile dysfunction (ED) is unknown. Few studies have been conducted and in those that have been conducted the results are contradictory. In some countries, DHEA is available only with a prescription. In the U.S., it is sold over the counter as a “health supplement”. This article provides information for anyone thinking about buying the supplement. DHEA is described in biology as a “steroid precursor”. It is produced in the body from cholesterol and used by the body to produce steroid hormones like estrogen and testosterone. Scientists have seen that DHEA itself has biological activity similar to that of other male hormones, but it is considered weaker than testosterone. What Benefits Might DHEA Offer? You may see supplements advertised as “DHEA testosterone boosters”. The theory is that increasing DHEA blood levels by swallowing a supplement containing it could increase circulating testosterone levels. Testosterone cannot legally be purchased without a prescription. Low dose testosterone gels can be purchased over the counter in some areas without a doctor’s prescription. Testosterone is a steroid, accompanied by all of the side effects caused by other steroids. It is likely that very little of it would reach the bloodstream if it were taken orally anyway. People who use it for performance enhancement generally have testosterone injections, which are illegal without a prescription. If the cause of ED is believed to be low testosterone, doctors can check testosterone blood levels and prescribe testosterone replacement therapy. It is necessary to monitor the dose and dosage changes are often needed to correct the low testosterone level without causing side effects like acne, anger, confusion and aggressive behavior. There is very little evidence suggesting that DHEA testosterone boosters actually increase testosterone levels. Most people who take the supplement do so without doctor supervision. They may believe they see benefits related to taking the supplement, but their beliefs are not confirmed through blood tests. Low testosterone is not the only cause of ED. Serious health problems including heart disease and undiagnosed diabetes can cause ED, too. If you have problems with sexual function, it is best to talk to your doctor before trying to treat the problem on your own. Any side effects or precautions? No side effects have been seen at doses of 50 milligrams per day. Higher doses of DHEA may cause side effects like those of testosterone. DHEA use is banned in the Olympics and in other “no doping” sports. Athletes have been suspended due to DHEA use. The supplement shows up in blood tests. It is possible to differentiate between DHEA produced by the body and the supplement. Because the supplement is a precursor for estrogen, as well as testosterone, it could raise estrogen levels. There is also evidence that DHEA competes with testosterone in the body. Either of these mean that the supplement could actually worsen any complaints associated with low testosterone. 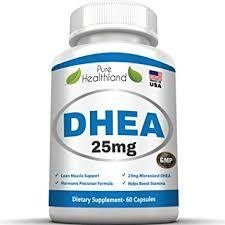 DHEA can have an effect on hormone-sensitive cancer, such as certain kinds of breast and prostate cancer. Like other hormones, DHEA can cause the hormone sensitive tumors to grow and worsen the cancer. So is DHEA a Supplement Worth Taking for ED? Because of the risks associated with DHEA and the lack of any clear evidence of DHEA benefits for ED, it really doesn’t seem that it is a supplement worth taking. This is obviously an arguable point. Supplement manufacturers would say that it “may” be worth taking, if they were being honest. If you do decide to take it, take a low dose of less than 50 milligrams and be wary of side effects. If you experience any negative effect, stop taking it immediately. There are other natural treatments for erectile dysfunction that are considered safer and more effective. Those are worth looking into as well.